It’s been quite a year. Troubling for many. We are facing big issues in our time. But that’s what faith is for. And, that’s what churches are for. Advent and Christmas remind me to face such times with an open heart, hands extended to others, feet on the path of Jesus, and trusting in the God who is birthed anew in each act of compassion, justice, connection, love. 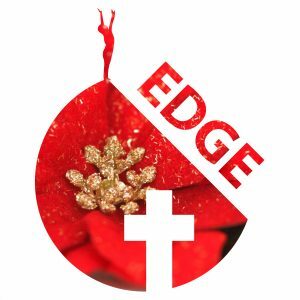 It is Edge’s privilege to work with people like you, who are daring new things in the midst of such times. And I want to say thank you to all of you who take the risk. It is to risk failure, criticism, misunderstanding, and also hope. It is to say “Yes!” to the Spirit seeking new ways to touch, heal and reconcile our lives and the world. Daring greatly and risking loss we receive even more. This is a paradox of Christian hope. These are times for daring greatly in love, and that can’t happen alone. It has been an honour to walk with the Edge team this year and with all of you who are responding to the stronger call of what God is up to in the world. Thank you! The federal government, through CMHC, believes in the value and impact of United Churches and so has provided $300,000 in funding (half grant, half interest free loan) for the United Church to better understand its properties across the church and how to use them to ‘Love their Neighbourhoods’. We are partnering with the Center for Progressive Renewal in a pilot to walk more closely and deeply with congregations seeking to ReVision their ministry for vital sustainable mission. The new Skylight Festival saw over 500 participants and is looking forward to year 2 with even more arts, faith and justice partners for deep play, generous space, and peace. Of John the Baptist, Jesus said, “Truly I tell you, among those born of women no one has arisen greater than John the Baptist; yet the least in the kingdom of heaven is greater than he.” It is our weakness (too weak to do it alone) and our willingness to surrender (not to win) that makes great the children of God: a surrender to the stronger call of what God is up to in our day. May the joy of the One to whom creation glowed ‘err yet his foot had touched the earth’ bless you greatly this Christmas. Rob, I am thrilled with the many ways that you and Edge have led the United Church to new approaches creating the church of the future. It has been a pleasure to work in partnership with you and your team and I am excited by the revealing future through the work of Spirit.